Slim down and firm up with this Bikini Body Complex designed to help you burn mega calories and deliver long-lasting results. Turn on the music, get in the zone, push yourself hard, and focus on what you want the most! Start this bikini body complex with a complete warm up routine. 1. Dumbbell swing: 60 seconds. Stand with your feet shoulder-width apart and hold a dumbbell with both hands. Squat and bring the dumbbell between your legs. Stand up and swing the dumbbell up to about chest height. 2. Chest press punch up: 45 seconds. Lie on your back with your knees bent, your back flat and hold a dumbbell in each hand. Squeeze your abs, lift your right shoulder off the floor and punch up with your right arm. Lower your arm to the starting position and repeat with the left arm. 3. Thrusters: 60 seconds. Stand with the dumbbells in front of your shoulders and the palms facing your body. Squat and, as you stand up, extend your arms above your head. 4. Dumbbell side bend: 30 seconds + 30 seconds. Stand with your feet shoulder-width apart and hold a dumbbell in your right hand. Bend to your right side, as far as it feels comfortable, and pause. Return to the starting position, repeat for 30 seconds and then switch sides. 5. Split squat press: 30 seconds + 30 seconds. Start in a split leg position, with one leg forward and one leg back, and hold a dumbbell in each hand. Flex your knees, lower your hips and position the dumbbells at your shoulders, with your palms facing forward. As you stand back up push the dumbbells up and fully extend your arms. 6. Toe touch: 45 seconds. Lie on your back, holding a dumbbell with both hands, and lift your legs until they’re perpendicular to the floor. Extend your arms, lift your shoulders off the floor and try touching your feet with the dumbbell. 7. Bear squat: 60 seconds. Get down on your hands and knees, with your wrists under your shoulders and your knees hip width apart. Straighten your legs and lift your hips toward the ceiling. 8. Chest fly: 45 seconds. Lie on your back with a dumbbell in each hand, your arms up, and the palms of your hands facing each other. With your elbows slightly bent, lower your arms out to sides until you feel a stretch in your chest muscles. Return to the starting position and repeat the movement. 9. Romanian deadlift: 45 seconds. Stand with a dumbbell in each hand, push your hips back and lower your torso until it’s parallel to the floor. 10. Shoulder to shoulder press: 60 seconds. Stand straight and hold a dumbbell with both hands in front of your right shoulder. Extend your arms and push the dumbbell up and over your head. Bend your elbows and slowly lower the weight to your left shoulder. Stretch your body and improve your flexibility with this 10 minute stretching routine. 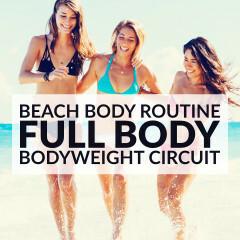 Slim down, firm up & burn mega calories with this Bikini Body Complex for women!